For the wealthy few, `the sky’s the limit’ in terms of what can be accomplished in a dedicated home theater. 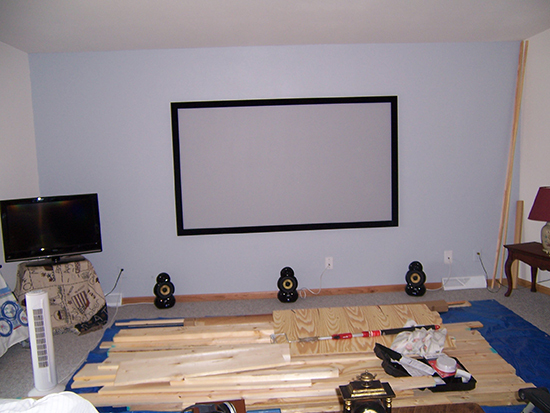 For the rest of us, the challenge is to create a World-Class Home Theater System on shoe-string budget. 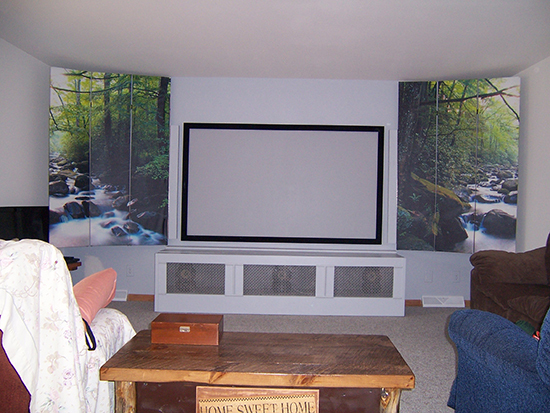 After spending my formative years designing home theaters for every income bracket, I found myself at the ripe old age of 61, sitting in a cabin in Wisconsin, wondering how to incorporate a dedicated home theater into an open living-dining-kitchen area. To further complicate the situation, it couldn’t just be any home theater – after all, I had my reputation to consider. It had to be dynamic, unique and most of all – hidden. Well, I must have sat in my `thinking’ recliner, starring at THE wall, for at least two weeks, building every possible type of theater-scenario in my mind, only to tear it down again as a result of some aspect that didn’t work with the original intention of the area. I must have eliminated a hundred designs that would have otherwise `taken over’ the area. Finally, I resigned myself to the fact that I would have to create a new protocol as I went along. I began by painting my only wall a light grey to differentiate it from the rest of the Living room. Next, I installed a `fixed’ 92” HD screen to the wall, centering it between the two sides and keeping it slightly above eye-level when seated. As I feared, once mounted, it immediately became the focal point of the entire area. When someone came to visit, they commented on how the entire area had now become a theater, relegating the living room to a single purpose, and even pulling the dining and kitchen into the realm of the theater proper. My wife just smiled, knowing that I must have something up my sleeve. The problem was that at the time, I was wearing short sleeves. Nevertheless, I rolled them up and moved on to step two. I went to the local lumber yard and purchased sufficient lumber to build a 22” x 22” x 8’ `box’ that would house the front left, center and right cabinet speakers. (There is no substitution for cabinet speakers, especially if you are serious about your sound.) I used 2×4’s to make the frame, and 1×4’s and 1×12’s to finish the front, with birch completing the sides. No specific bottom or back was created, leaving the internal frame structure to take on a `Swiss-cheese’ complexion in order to eliminate as many parallel surfaces as possible. To complete the `box’, air and sound circulation was incorporated using 3 `tin grates’ across the front, (a remnant from my last `window-seat theater box’). 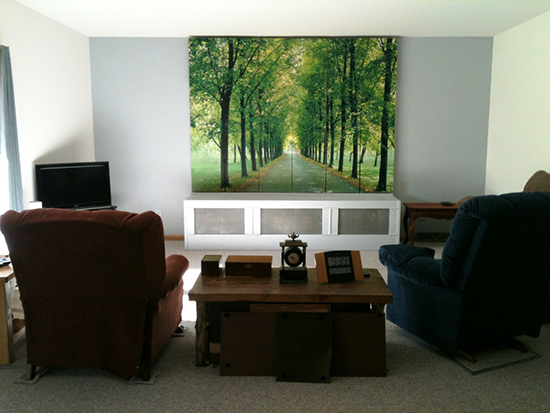 Tin grates are easy to paint and sonically `disappear’ as a result of their low-mass qualities. Also, with a little silicone around the inside edges, vibration remains substantially below human detection. To achieve some type of cosmetic `blending’, the `box’ and grates were painted the same color as the wall. At this point, I was looking at a rather plain `box’, albeit one that blended quite well into the wall. But I was still looking at a 92” fixed screen in the center of the wall, and as long as that screen was in full view, the entire area continued to take on the persona of a theater, rather than a home living-dining-kitchen area that would otherwise `convert’ to a theater. 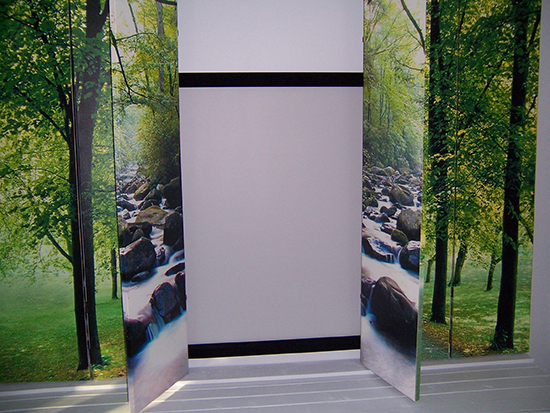 In any event, after searching the Internet for just the `right’ room divider, I came upon one that was, in essence, a huge double-sided photograph of a forest divided into 6 panels. I desperately needed something that would displace the screen as the `new’ focal point of the area. 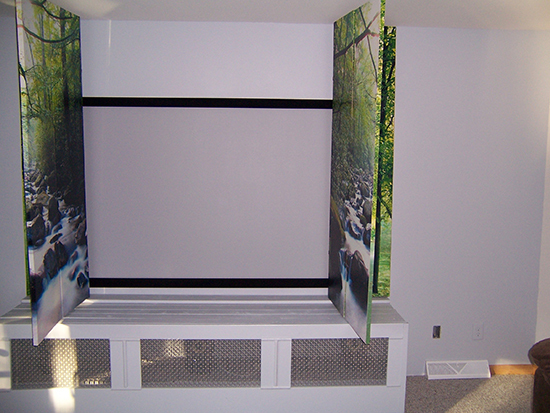 The room divider fit the bill, both in terms of esthetics and physical size (6’x8’). In addition, it weighed very little, thereby making it ideal to mount on the wall, over the screen. By further removing the center hinges of the room divider, it became a two-part object that opened in the middle. Now I felt that I had at last solved the riddle of the wall that took over the area. With the room divider closed, it indeed took over the area, but now it made a design statement and perfectly complemented a cabin, where looking at our new `forest wall’ was not that different than looking out our sliding-glass doors. Conversely, with the room divider open, the screen was now flanked by two scenes of water flowing over stones, creating still another `inviting’ scene and minimizing the starkness of the wall. Having solved the design problem of the area, it was now time to create the workings of the system itself. A projector, electronics, front and rear speakers and subwoofer all had to work within the area…and they all had to be hidden. So, I went back to my reclining `think tank’ and spent another week thinking about the various ways that I could accomplish the rest of this task. I decided to incorporate a `hide in plain sight’ strategy. My wife and I went out looking for a coffee-table that would fit into the cabin-environment, yet also provide sufficient inside dimensions to accommodate the equipment (as well as to provide enough inside height to dissipate the heat that the equipment would generate). After some hunting, we found a coffee table that worked for both of us. It was large enough to house my electronics, and it looked like it belonged in a cabin. Although many of the new front projectors have adjustments for off-set installations, digital artifacts are greatly minimized when firing a projector directly onto the screen from the front (or directly from the back). Therefore, I was thankful to have luck on my side – because the coffee table worked well for both design and function when set in direct line-of-sight with the `box’, at about 13 feet away from the screen. The rest of the system fell into place. I researched front-projectors for one that would have a high enough light output, be affordable and yet still provide a reasonable lamp life, when set to full output. Although there are several projectors that would satisfy the specifications of my area, I ultimately choose one whose support and warranty departments have gone `above and beyond’ when dealing with problems. I choose an `Infocus’ DLP model. `Infocus’ has always been a dependable product, and their service department is second-to-none. More than once, over the years, I had called them with a customers’ dying lamp, and they responded by sending a replacement overnight. In other cases, if I sent a dead unit to their repair center, their response was to send back a working unit (in a timely fashion, and many times without charge). A Blu-Ray player was chosen to take advantage of the 1080p resolution of the projector, and although I have always chosen Sony for `out of the box performance’, I instead used an `LG’ for its clear and simple menu, and its impressive load time. Now the rear-channel speakers presented their own problems. First, there was no place to locate surround speakers either on the rear walls or floor. However, I was once again fortunate to have had a beam running the full length of the cathedral ceiling which was directly over the coffee table/seating area. Utilizing what would normally be small exterior speakers, I again choose Polk Audio Atrium model speakers for the rear channels because they were easily mounted tight to the ceiling on one side of the beam – and as they were available in white, their presence went all but unnoticed. Thereafter, by aiming them down at the seating area, a full-spectrum surround was accomplished. 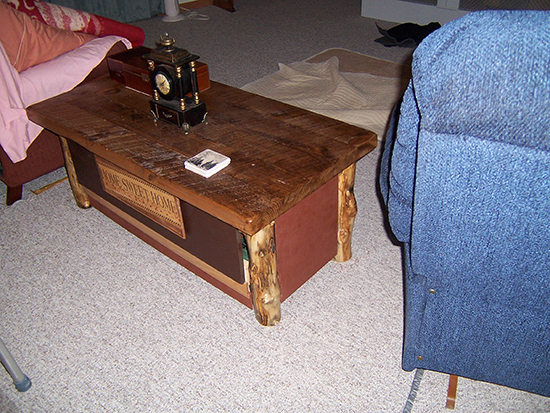 Finally, everything was wired through the floor (which was wood), and originated under the coffee table. I didn’t think it was possible, but a miracle is what I needed, and after all was said and done, a miracle is what I got. Now, however, it was time to see whether or not I had completed my goal of accomplishing a dynamic and unique theater on a shoestring budget. Here then, is what I spent. Note: all costs are approximate, and model numbers may have changed.